So you want to convince your boss to let you telecommute, and you’re working on a telecommuting proposal that hones in on how your job could be done from home? To be as effective as possible, your proposal should focus on what telecommuting can do for your employer, not for you. So be sure to include benefits of telecommuting--both general and specific--for your employer. You will need to decided which of the the specific benefits are applicable to your situation, though these "dos and don'ts" of a telework proposal can help you focus on the most convincing ones. Here are some of the more general benefits of telecommuting to employers, which you may be able to apply to your specific situation. 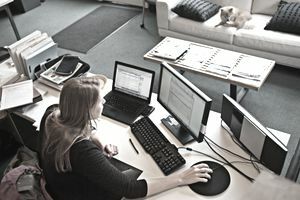 Telecommuting can save office space. Call center companies have figured this out and have been actively recruiting people to work from home for years. Whole call center locations have been phased out and real estate and utility costs eliminated. Now, one person opting to work from home (particularly if it’s only a part-time telecommuting arrangement) may not save your company much, but if office space is tight at your company this argument could have some sway. Many available tools that aid in telecommuting are free. Think Skype, GotoMeeting, Google Docs to start, but there are so many free apps that are useful in telecommuting. And in addition to the many, many free collaborative tools, a lot of companies have already built the technical infrastructure, such as VPNs or SharePoint servers, that are needed to accommodate telecommuters. And while that wasn’t free, putting it to use as a telecommuter will not likely add any cost. Telecommuting is good for the environment. One less commuter means a bit less greenhouse gases going into the environment. While this is not likely a point that will affect the bottom line at most companies, firms that market themselves as “green” or eco-friendly may indeed see the environmental value of telecommuting as a persuasive point. And companies that offer commuting-related perks, like free parking or discounts on public transit will, in fact, see a positive effect on their bottom lines. Allowing telecommuting can decrease employee turnover. Telecommuting is a perk that employees won’t give up without a lot of consideration. The increased job satisfaction that comes with the independence this arrangement inspires also will help keep employees from leaving, sometimes even when better compensation is available elsewhere. Telecommuters can work a more flexible or work a non-traditional schedule. This could be your most convincing argument, but you should be careful what you promise on this. The lack of a commute can make workers more likely to be available in early morning or late evening hours. However, you don't want to be on call 24/7 either. Which Month Is Best For Job Hunting?